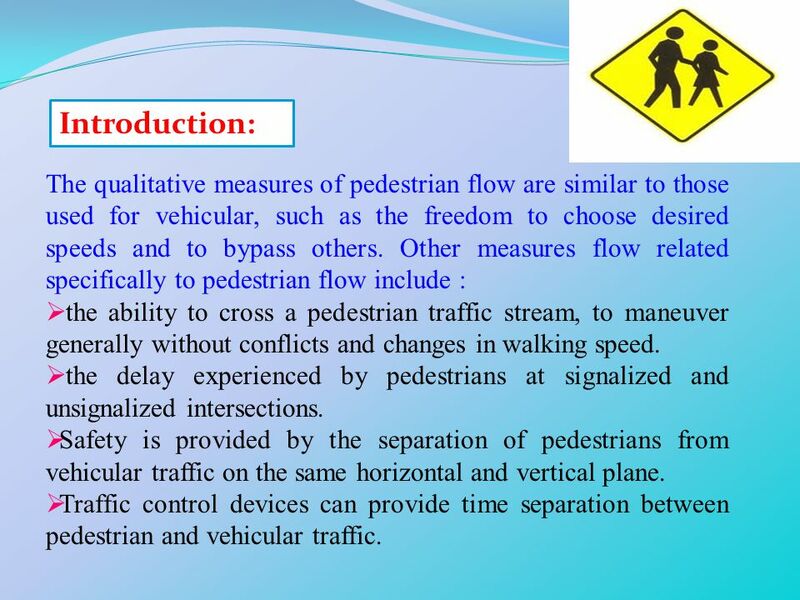 4 Introduction: The qualitative measures of pedestrian flow are similar to those used for vehicular, such as the freedom to choose desired speeds and to bypass others. 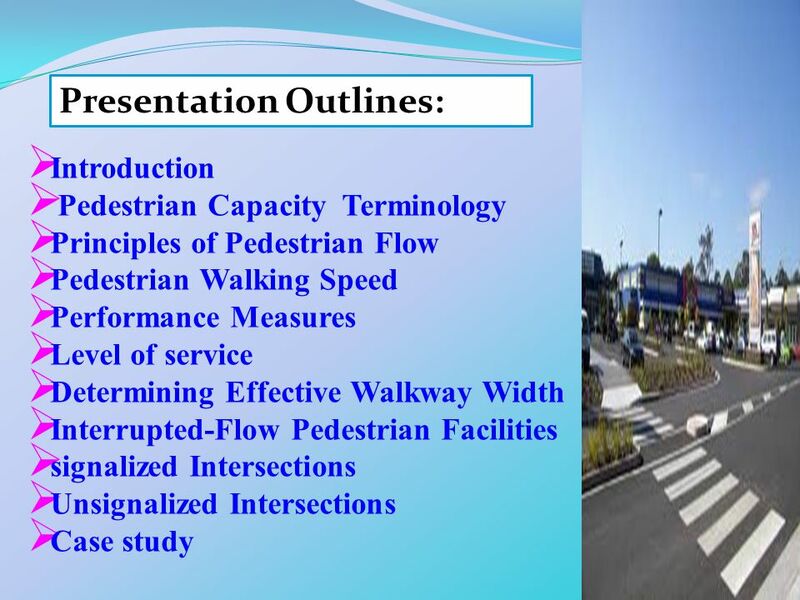 Other measures flow related specifically to pedestrian flow include : the ability to cross a pedestrian traffic stream, to maneuver generally without conflicts and changes in walking speed. the delay experienced by pedestrians at signalized and unsignalized intersections. Safety is provided by the separation of pedestrians from vehicular traffic on the same horizontal and vertical plane. Traffic control devices can provide time separation between pedestrian and vehicular traffic. 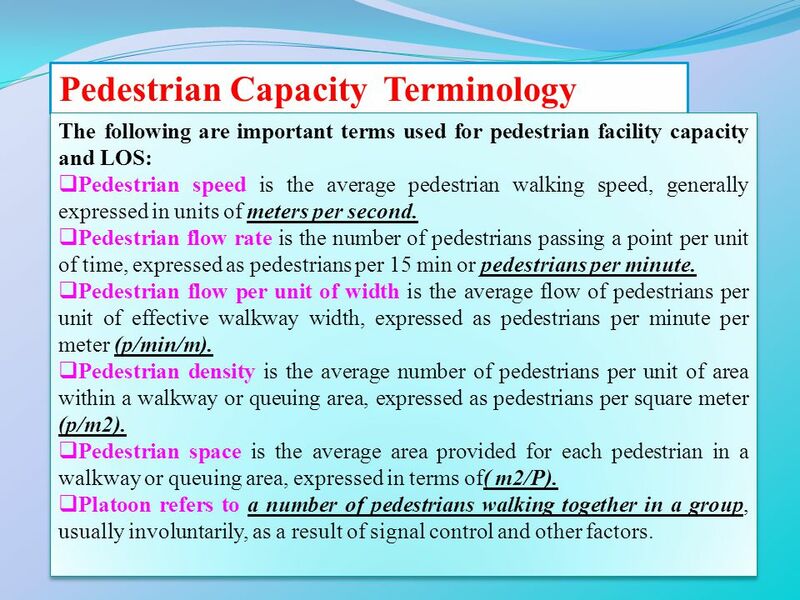 The following are important terms used for pedestrian facility capacity and LOS: Pedestrian speed is the average pedestrian walking speed, generally expressed in units of meters per second. 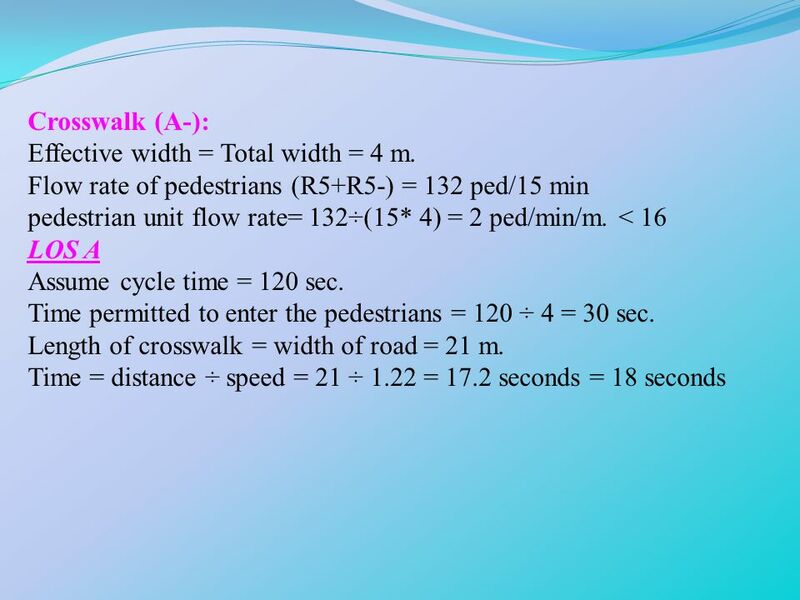 Pedestrian flow rate is the number of pedestrians passing a point per unit of time, expressed as pedestrians per 15 min or pedestrians per minute. 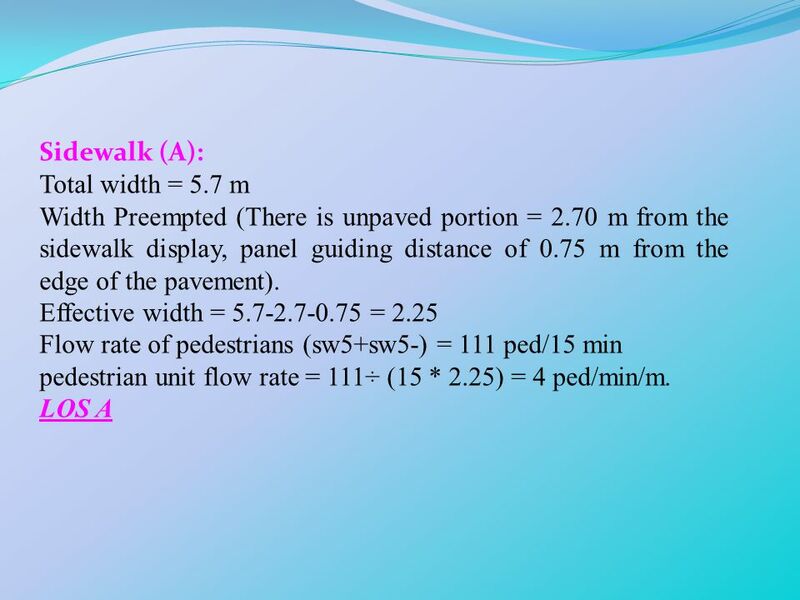 Pedestrian flow per unit of width is the average flow of pedestrians per unit of effective walkway width, expressed as pedestrians per minute per meter (p/min/m). 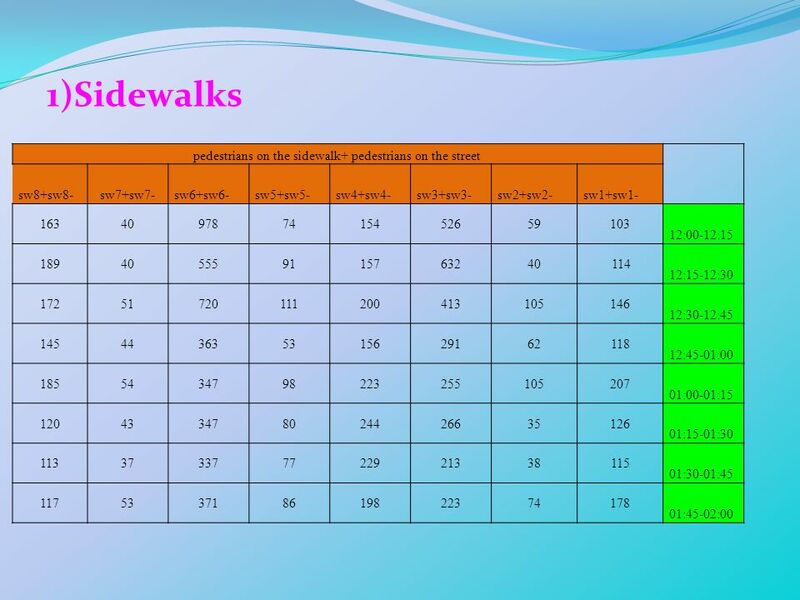 Pedestrian density is the average number of pedestrians per unit of area within a walkway or queuing area, expressed as pedestrians per square meter (p/m2). 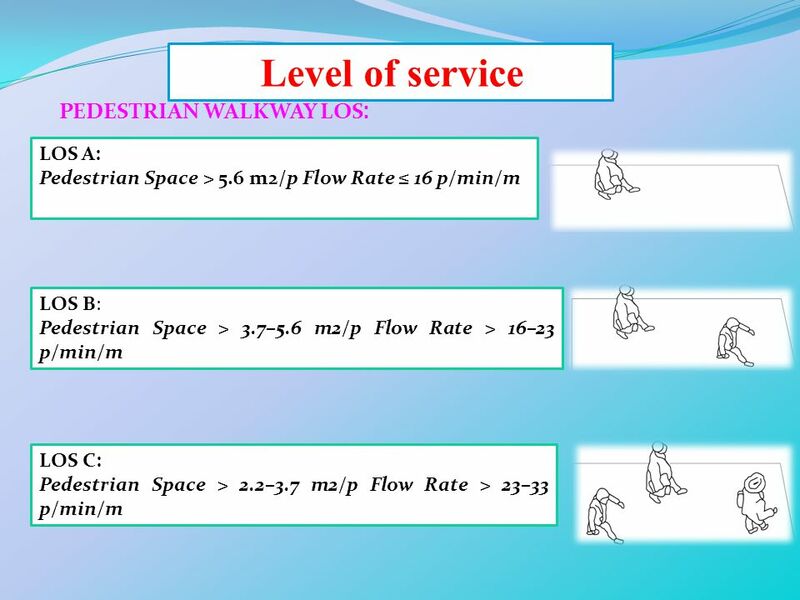 Pedestrian space is the average area provided for each pedestrian in a walkway or queuing area, expressed in terms of( m2/P). Platoon refers to a number of pedestrians walking together in a group, usually involuntarily, as a result of signal control and other factors. 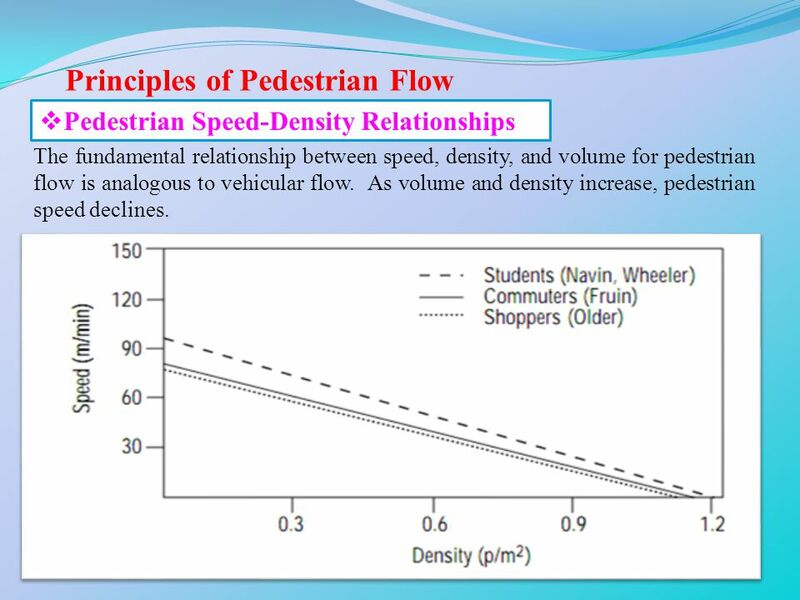 Pedestrian Speed-Density Relationships The fundamental relationship between speed, density, and volume for pedestrian flow is analogous to vehicular flow. 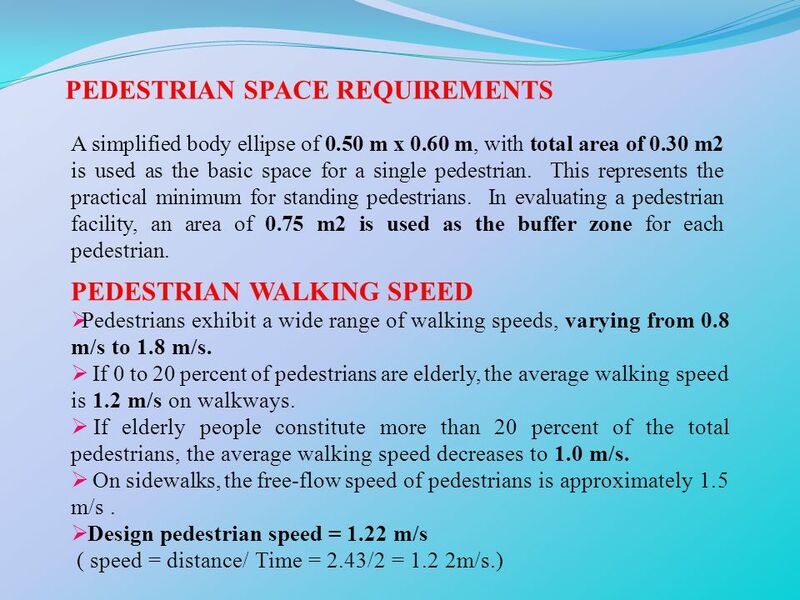 As volume and density increase, pedestrian speed declines. 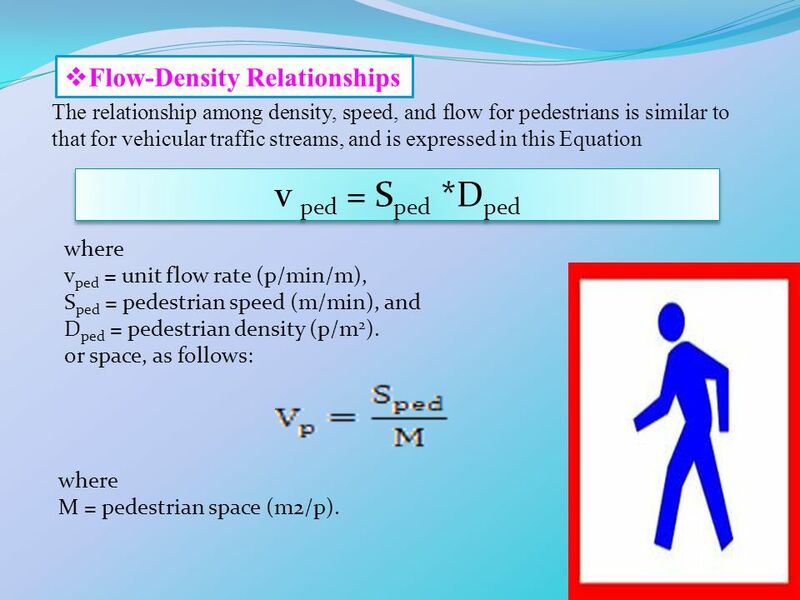 The relationship among density, speed, and flow for pedestrians is similar to that for vehicular traffic streams, and is expressed in this Equation v ped = Sped *Dped where vped = unit flow rate (p/min/m), Sped = pedestrian speed (m/min), and Dped = pedestrian density (p/m2). 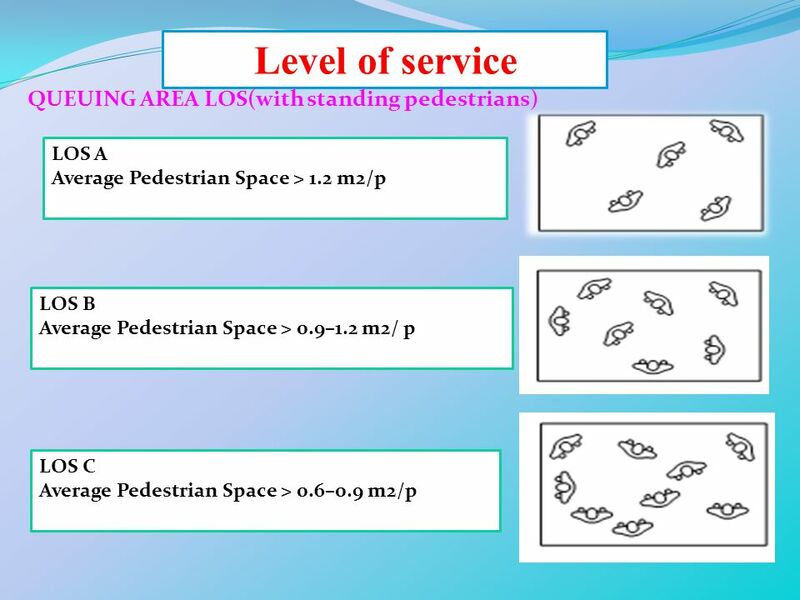 or space, as follows: where M = pedestrian space (m2/p). 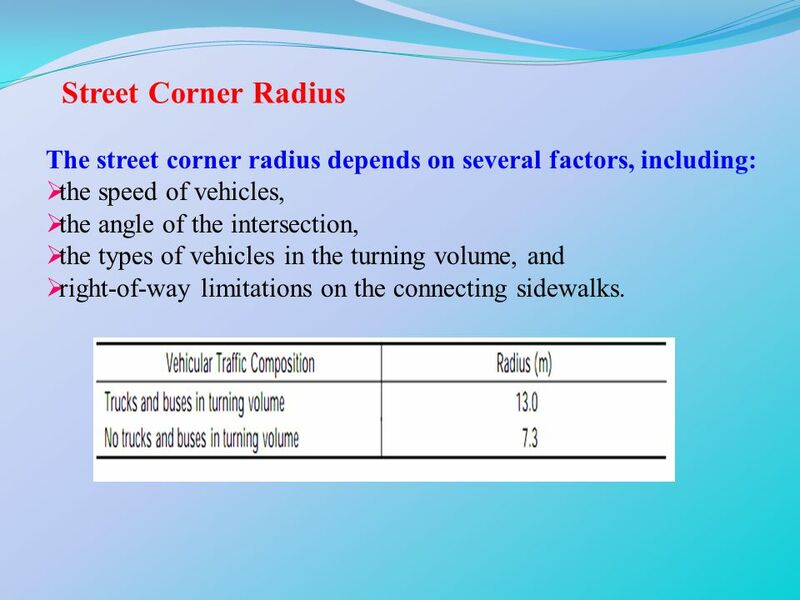 15 Street Corner Radius The street corner radius depends on several factors, including: the speed of vehicles, the angle of the intersection, the types of vehicles in the turning volume, and right-of-way limitations on the connecting sidewalks. 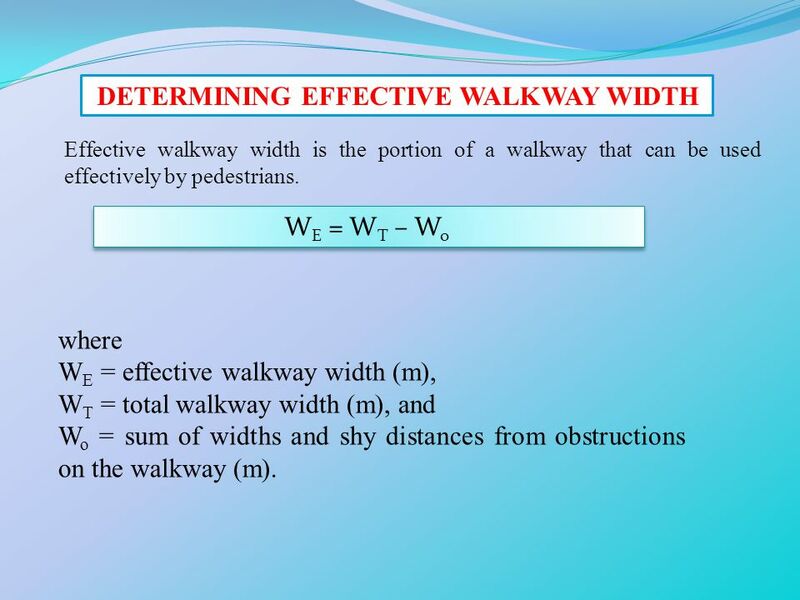 Effective walkway width is the portion of a walkway that can be used effectively by pedestrians. 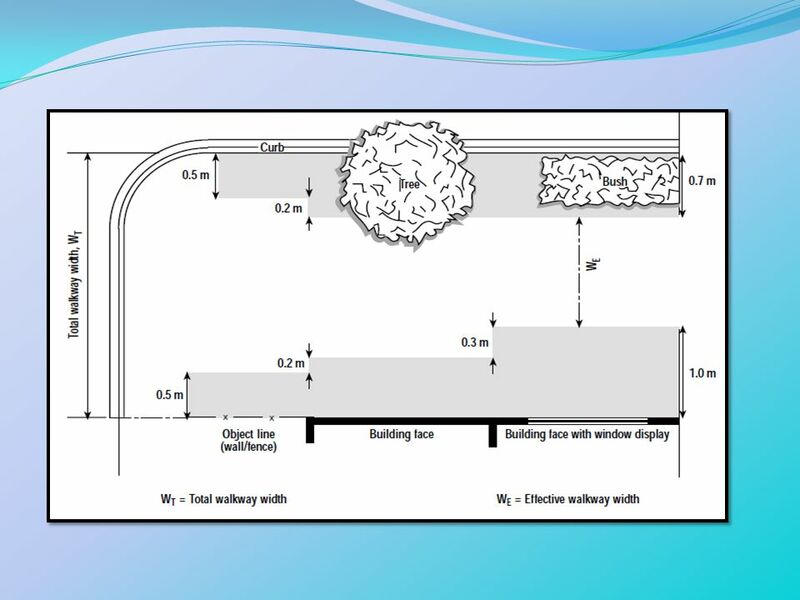 WE = WT – Wo where WE = effective walkway width (m), WT = total walkway width (m), and Wo = sum of widths and shy distances from obstructions on the walkway (m). 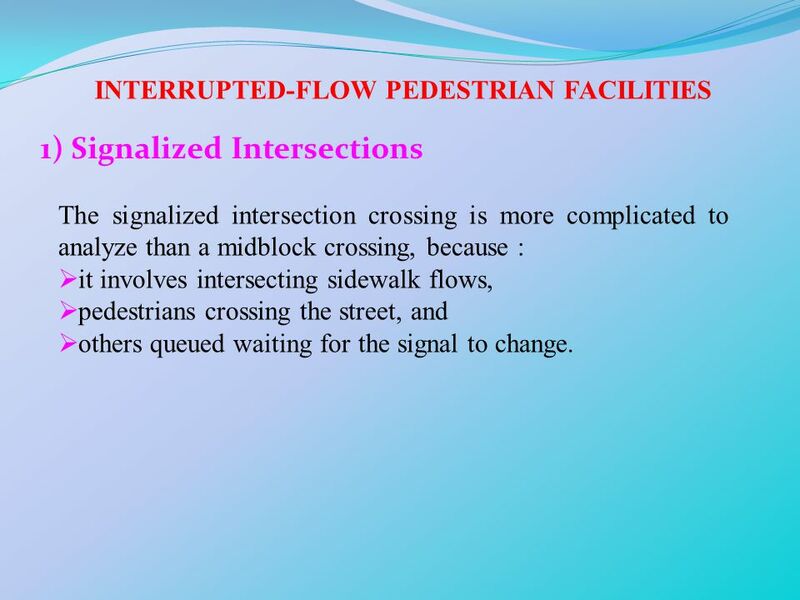 1) Signalized Intersections The signalized intersection crossing is more complicated to analyze than a midblock crossing, because : it involves intersecting sidewalk flows, pedestrians crossing the street, and others queued waiting for the signal to change. 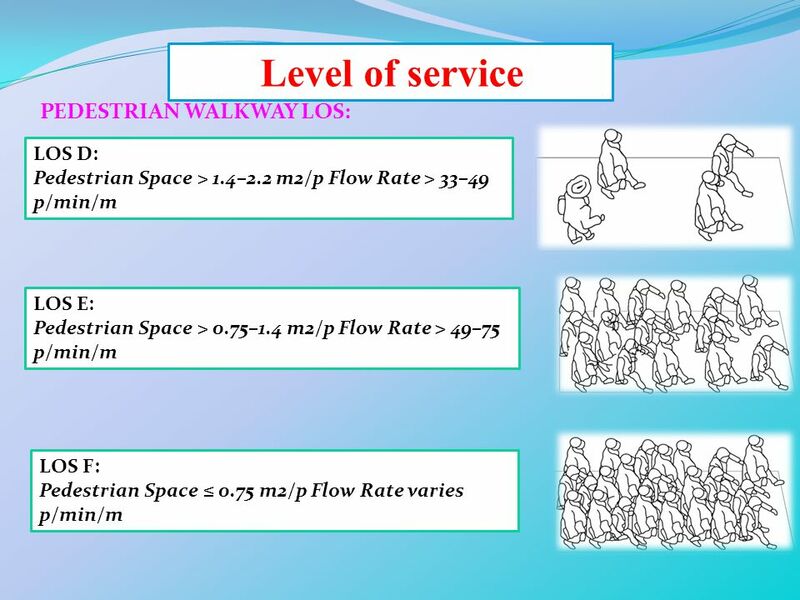 when pedestrian flow rates reach 5,000 p/h . 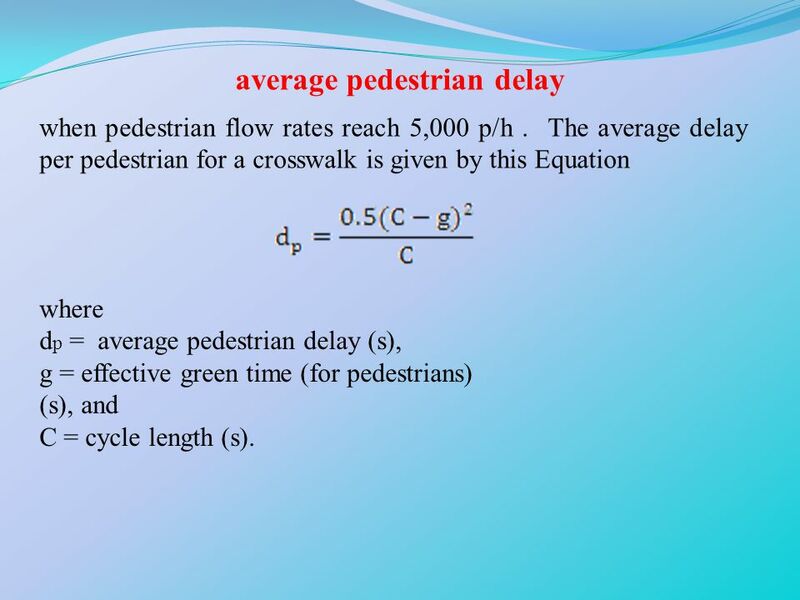 The average delay per pedestrian for a crosswalk is given by this Equation where dp = average pedestrian delay (s), g = effective green time (for pedestrians) (s), and C = cycle length (s). 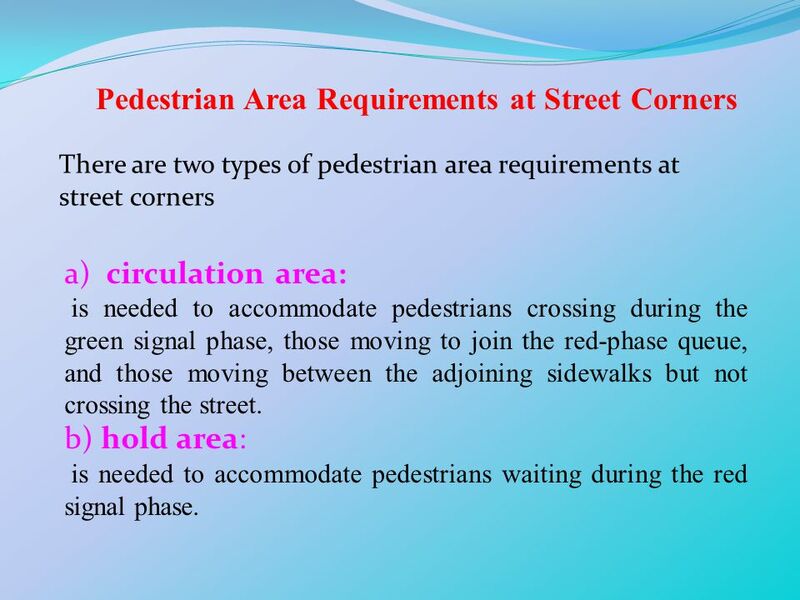 There are two types of pedestrian area requirements at street corners a) circulation area: is needed to accommodate pedestrians crossing during the green signal phase, those moving to join the red-phase queue, and those moving between the adjoining sidewalks but not crossing the street. b) hold area: is needed to accommodate pedestrians waiting during the red signal phase. 22 The following Exhibits shows the signal phase conditions analyzed in corner and crosswalk computations. 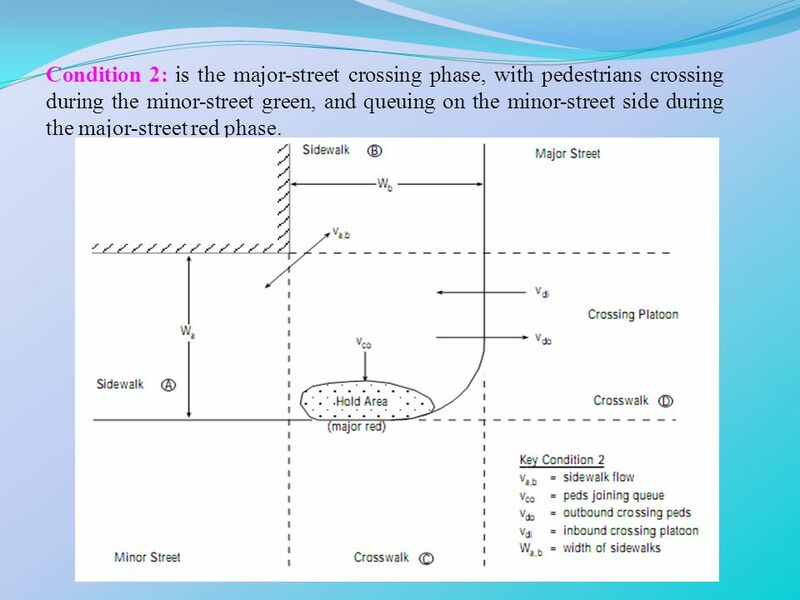 Condition 1: is the minor-street crossing phase during the major-street green, with pedestrians queuing on the major-street side during the minor-street red phase. 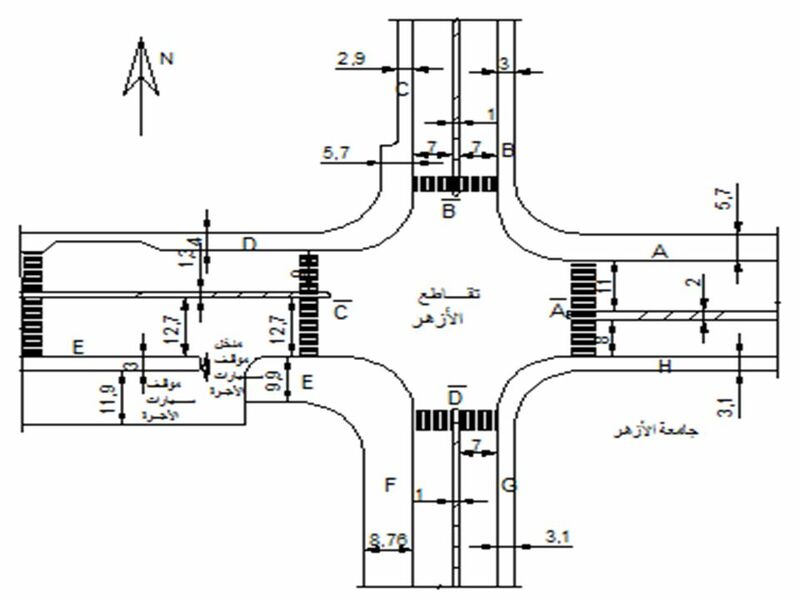 23 Condition 2: is the major-street crossing phase, with pedestrians crossing during the minor-street green, and queuing on the minor-street side during the major-street red phase. 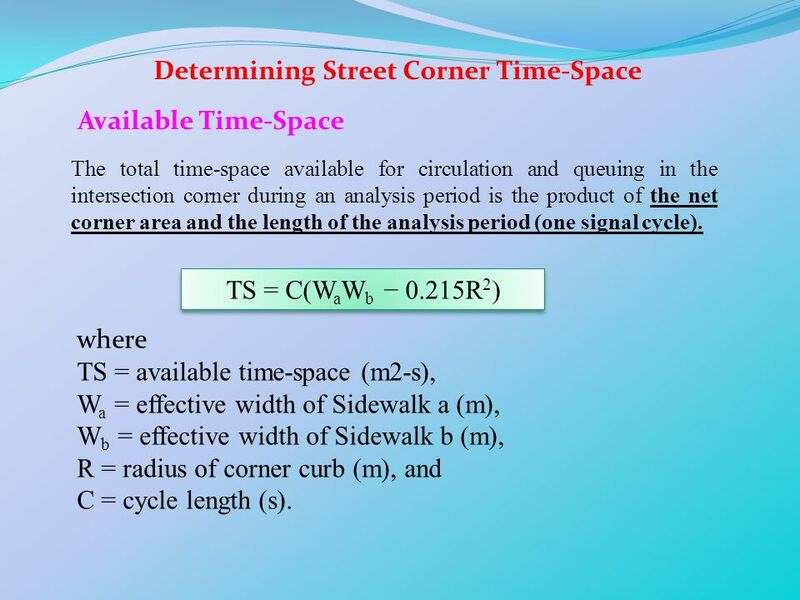 Available Time-Space The total time-space available for circulation and queuing in the intersection corner during an analysis period is the product of the net corner area and the length of the analysis period (one signal cycle). 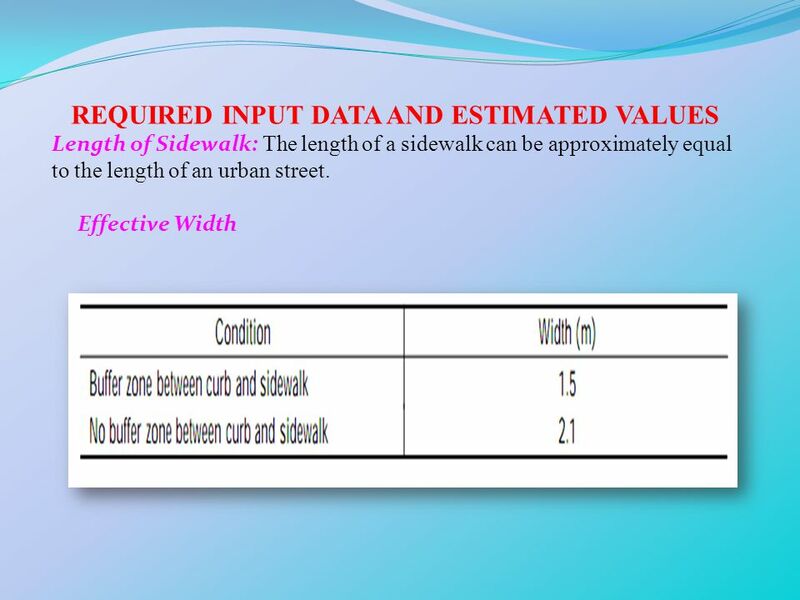 TS = C(WaWb − 0.215R2) where TS = available time-space (m2-s), Wa = effective width of Sidewalk a (m), Wb = effective width of Sidewalk b (m), R = radius of corner curb (m), and C = cycle length (s). 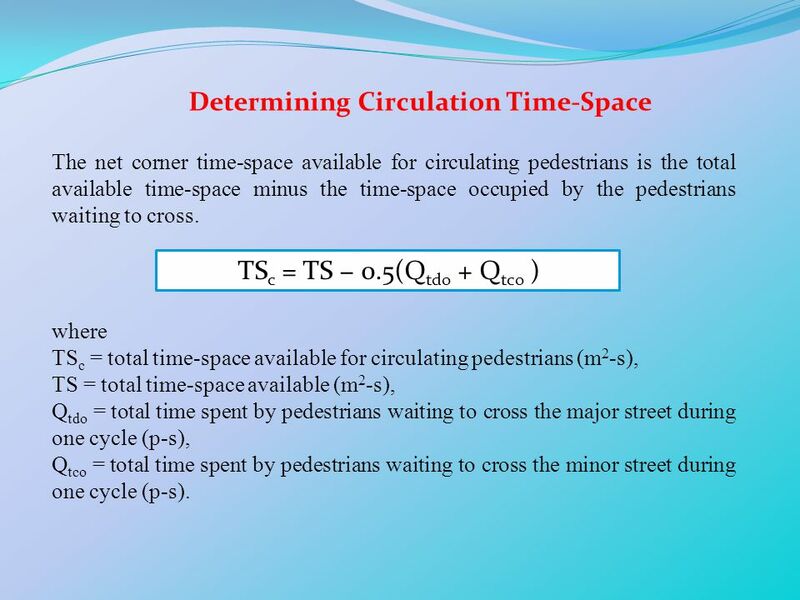 The net corner time-space available for circulating pedestrians is the total available time-space minus the time-space occupied by the pedestrians waiting to cross. 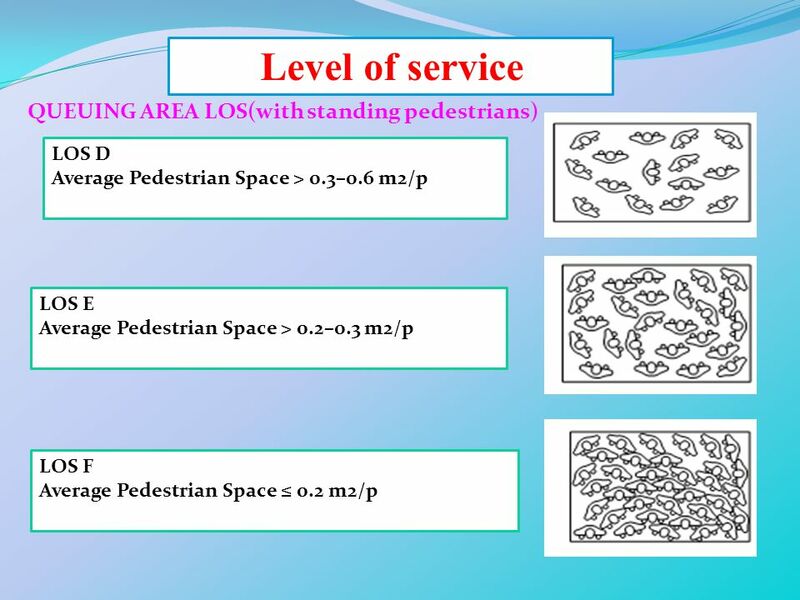 TSc = TS − 0.5(Qtdo + Qtco ) where TSc = total time-space available for circulating pedestrians (m2-s), TS = total time-space available (m2-s), Qtdo = total time spent by pedestrians waiting to cross the major street during one cycle (p-s), Qtco = total time spent by pedestrians waiting to cross the minor street during one cycle (p-s). 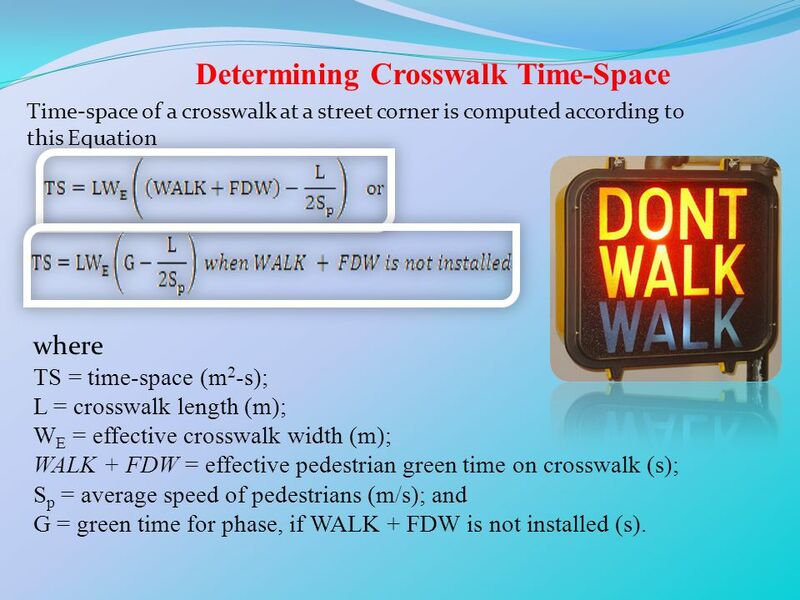 Time-space of a crosswalk at a street corner is computed according to this Equation where TS = time-space (m2-s); L = crosswalk length (m); WE = effective crosswalk width (m); WALK + FDW = effective pedestrian green time on crosswalk (s); Sp = average speed of pedestrians (m/s); and G = green time for phase, if WALK + FDW is not installed (s). 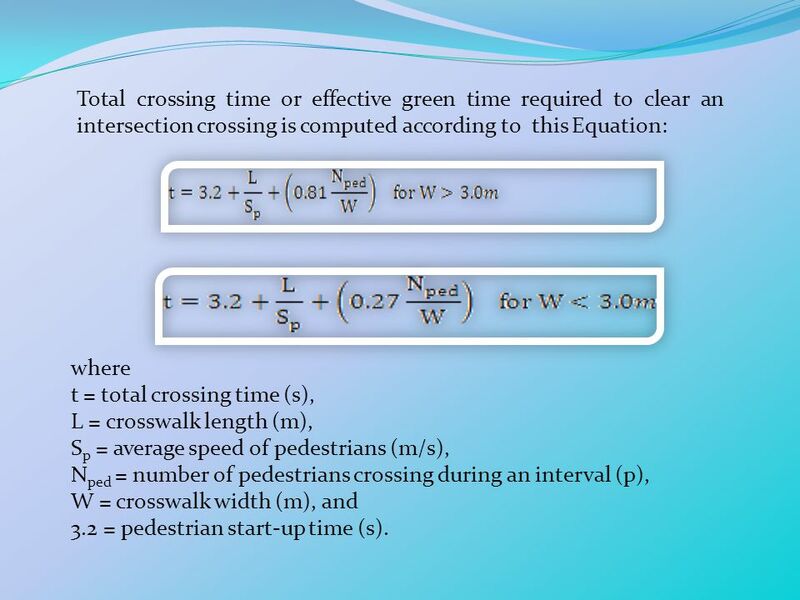 28 Total crossing time or effective green time required to clear an intersection crossing is computed according to this Equation: where t = total crossing time (s), L = crosswalk length (m), Sp = average speed of pedestrians (m/s), Nped = number of pedestrians crossing during an interval (p), W = crosswalk width (m), and 3.2 = pedestrian start-up time (s). 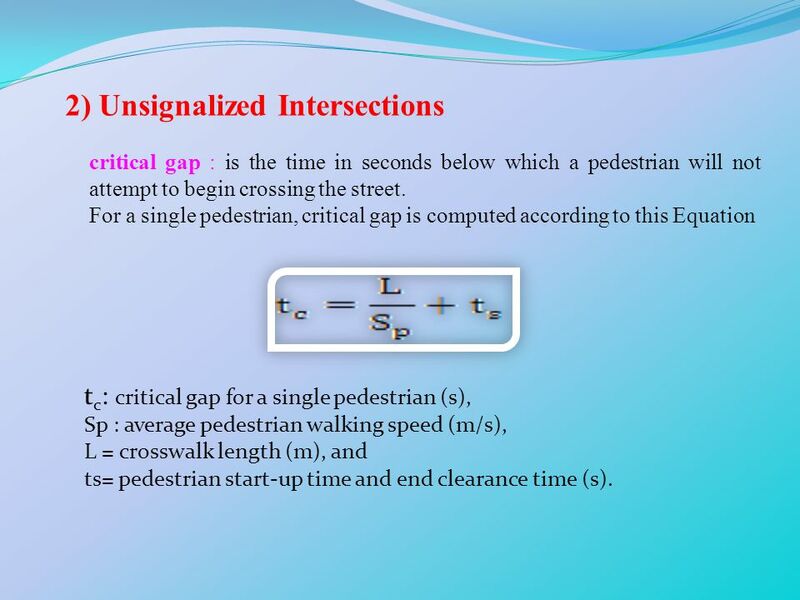 critical gap : is the time in seconds below which a pedestrian will not attempt to begin crossing the street. 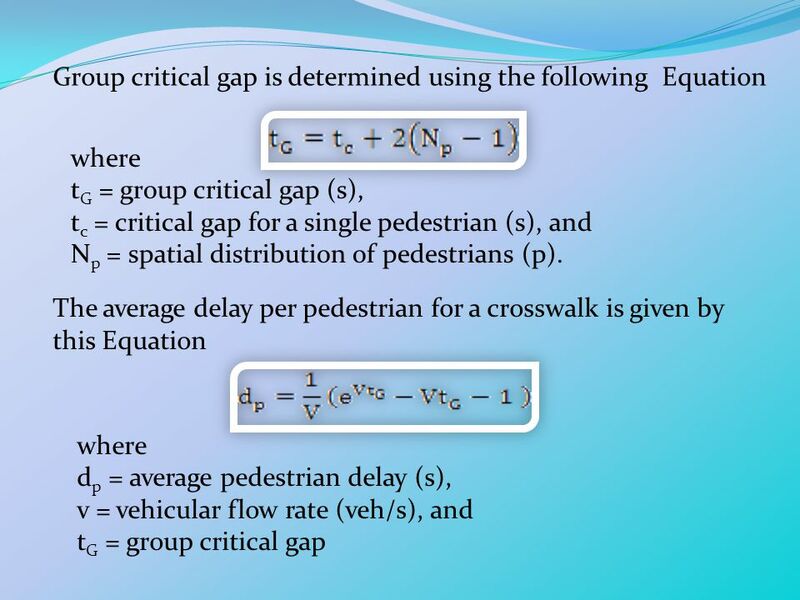 For a single pedestrian, critical gap is computed according to this Equation tc: critical gap for a single pedestrian (s), Sp : average pedestrian walking speed (m/s), L = crosswalk length (m), and ts= pedestrian start-up time and end clearance time (s). 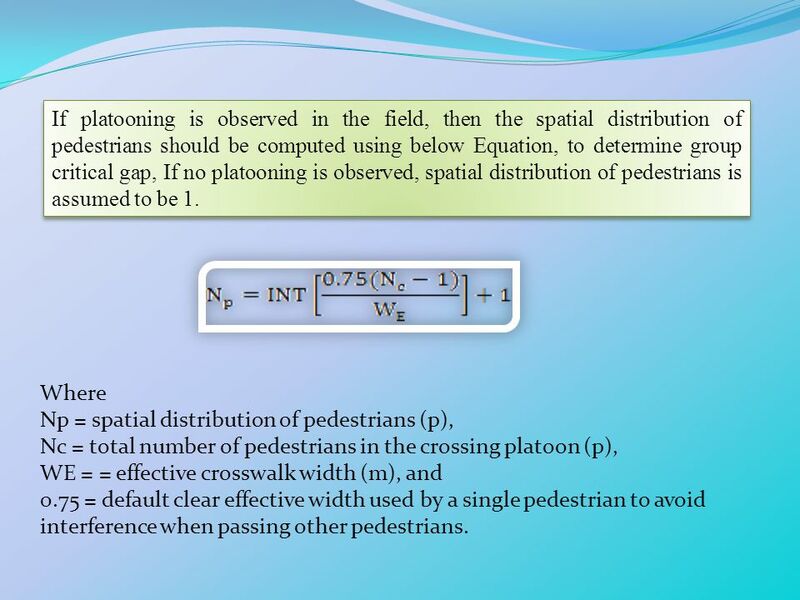 30 If platooning is observed in the field, then the spatial distribution of pedestrians should be computed using below Equation, to determine group critical gap, If no platooning is observed, spatial distribution of pedestrians is assumed to be 1. 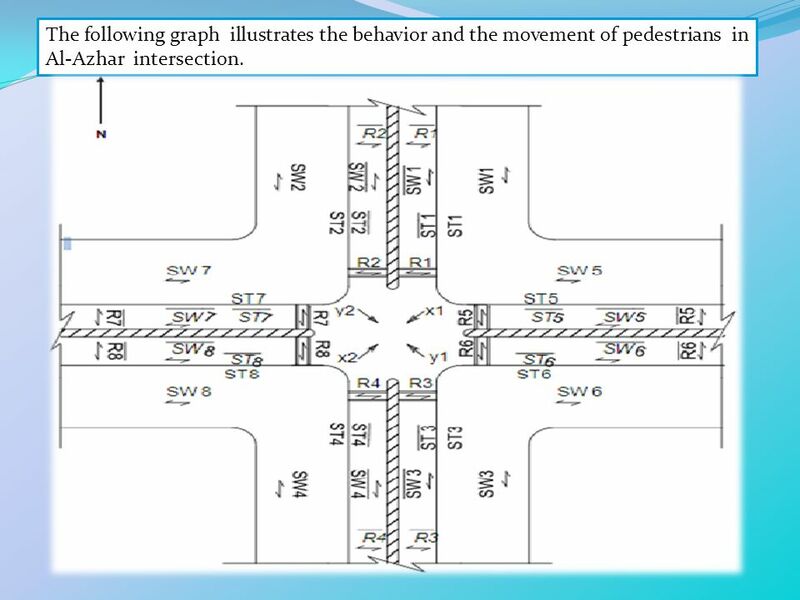 Where Np = spatial distribution of pedestrians (p), Nc = total number of pedestrians in the crossing platoon (p), WE = = effective crosswalk width (m), and 0.75 = default clear effective width used by a single pedestrian to avoid interference when passing other pedestrians. 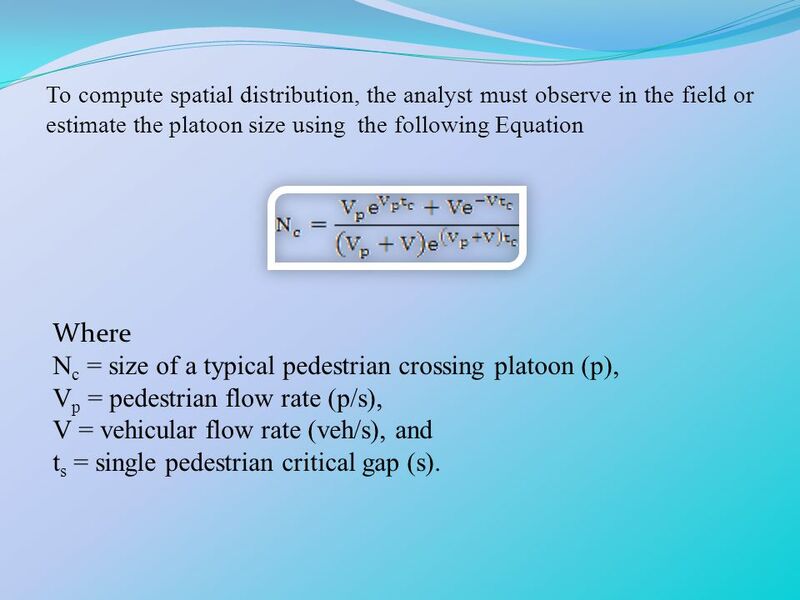 To compute spatial distribution, the analyst must observe in the field or estimate the platoon size using the following Equation Where Nc = size of a typical pedestrian crossing platoon (p), Vp = pedestrian flow rate (p/s), V = vehicular flow rate (veh/s), and ts = single pedestrian critical gap (s). 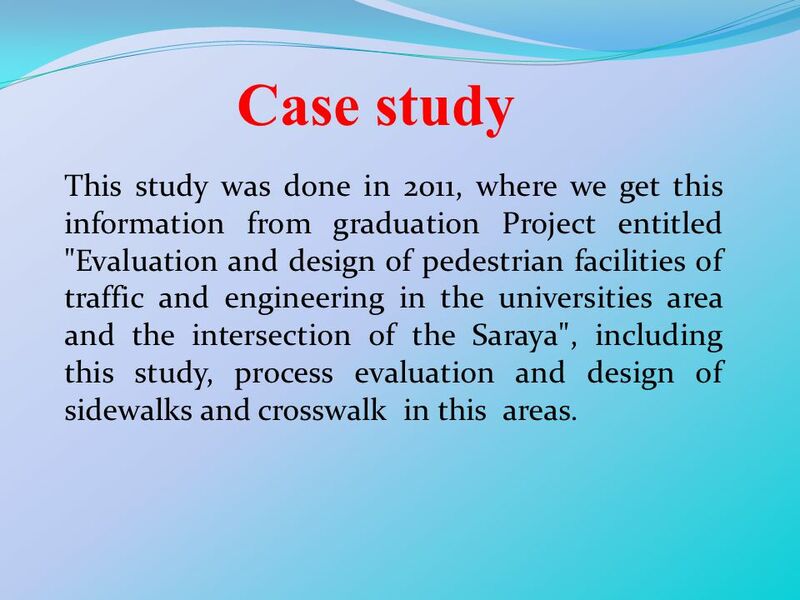 33 Case study This study was done in 2011, where we get this information from graduation Project entitled "Evaluation and design of pedestrian facilities of traffic and engineering in the universities area and the intersection of the Saraya", including this study, process evaluation and design of sidewalks and crosswalk in this areas. 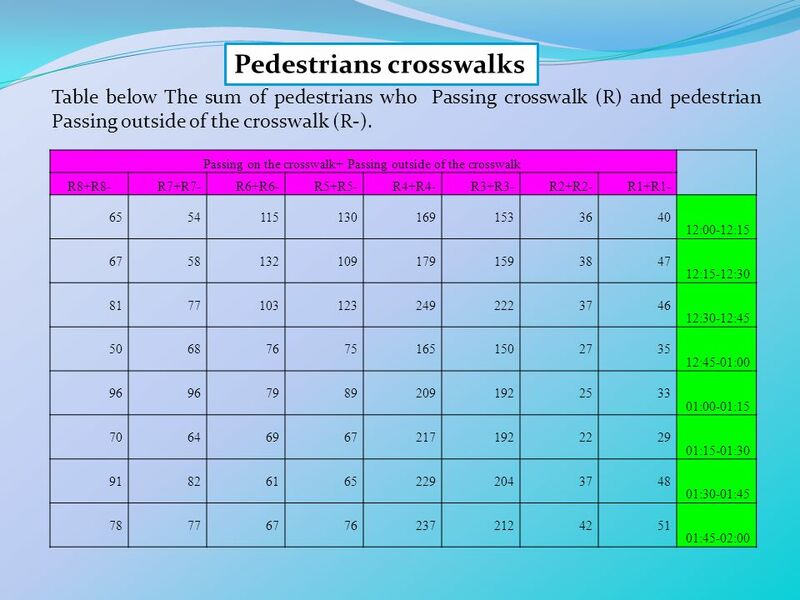 34 The following graph illustrates the behavior and the movement of pedestrians in Al-Azhar intersection. 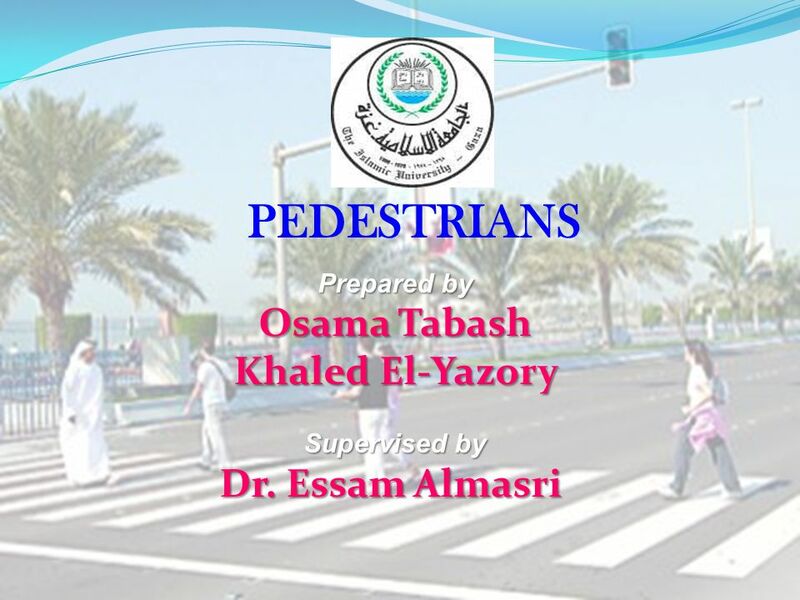 Download ppt "PEDESTRIANS Osama Tabash Khaled El-Yazory Dr. Essam Almasri"
Complete Street Analysis of a Road Diet Orange Grove Boulevard Pasadena, CA Aaron Elias Engineering Associate Kittelson & Associates Bill Cisco Senior. 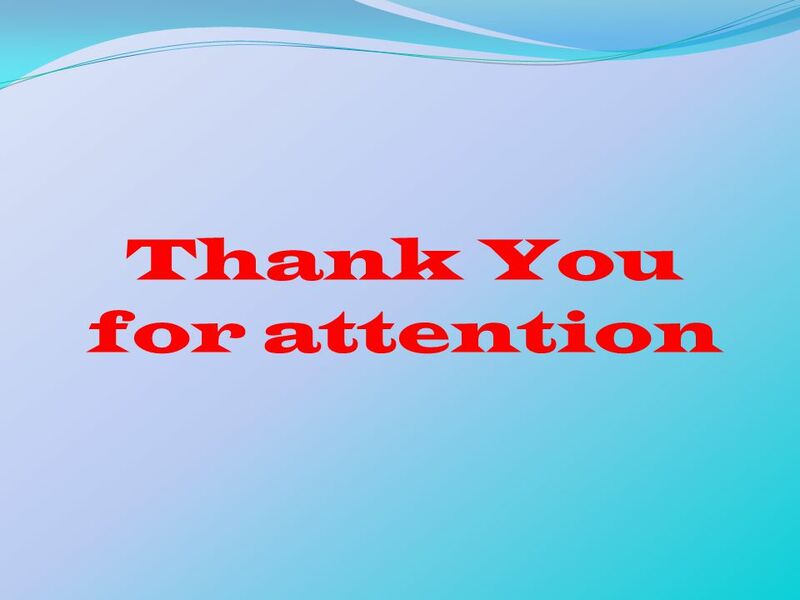 T3 Webinar September 2012 Performance Measures Edward J. Smaglik September 18 th, 2012. INTRODUCTION TO TRANSPORT Lecture 7 Introduction to Transport Lecture 7: Signal Coordination. CE 2710: Transportation Engineering Traffic Signals April 3, 2009 Nicholas Lownes, Ph.D. US Highway 17 (Center Street) Sidewalk Feasibility Study Town of Pierson, Florida. 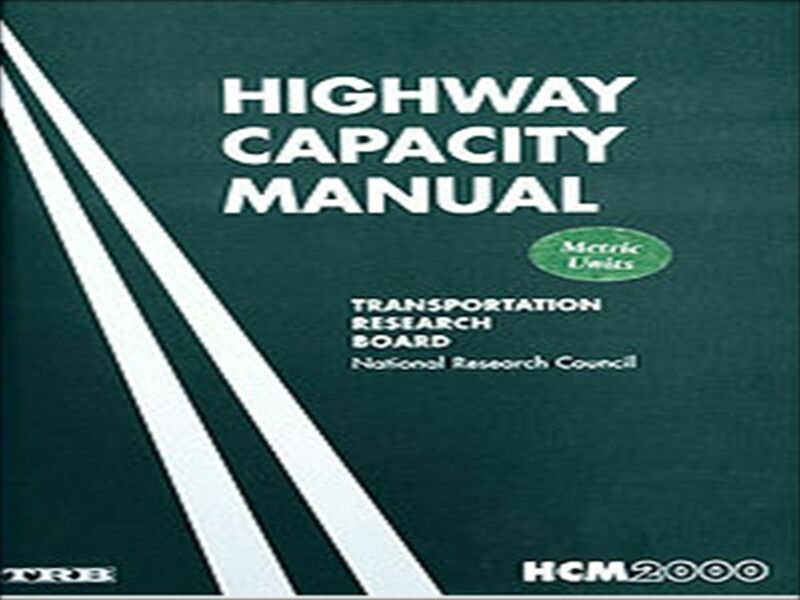 INTRODUCTION This chapter presents guidance on the application of geometric design criteria to facilities functionally classified as collector roads and. 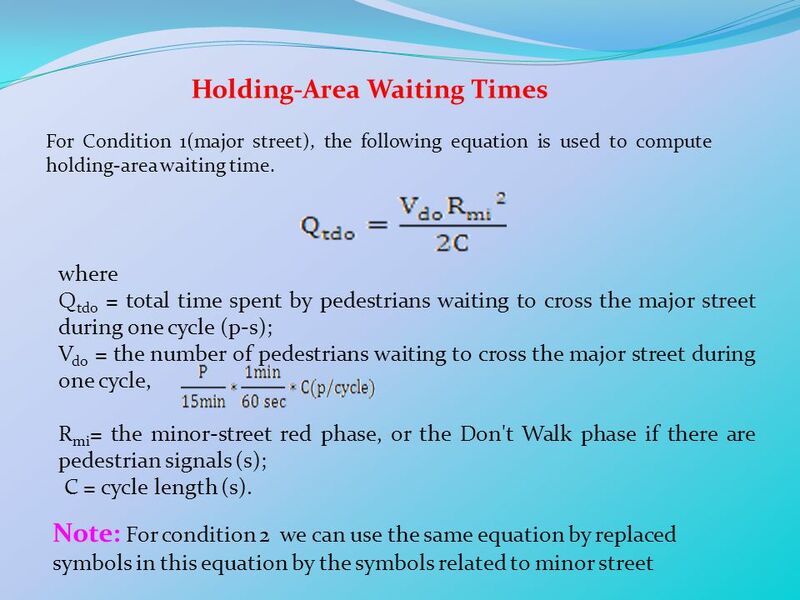 INTRODUCTION TO TRANSPORT Lecture 3 Introduction to Transport Lecture 4: Traffic Signal. Advance Preemption Costs More than Simultaneous Preemption: Fact or Fiction? 1 Channelization and Turn Bays. 2 Island Channelization flush, paved, and delineated with markings – or unpaved and delineated with pavement edge and. Some important pedestrian considerations 4-1. 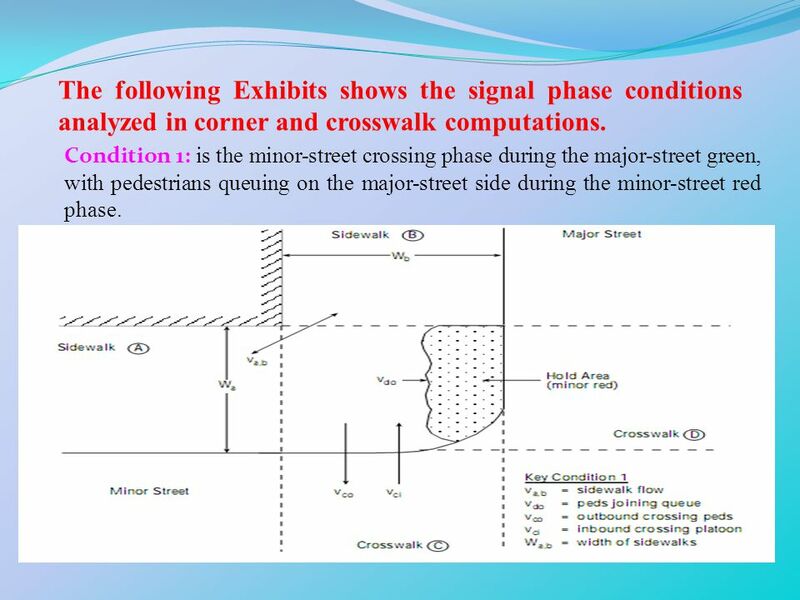 Skew increases crosswalk length, decreases visibility 4-2. Chapter 221 Chapter 22: Fundamentals of Signal Timing: Actuated Signals Explain terms related to actuated signals Explain why and where actuated signals. Progressive Signal Systems. 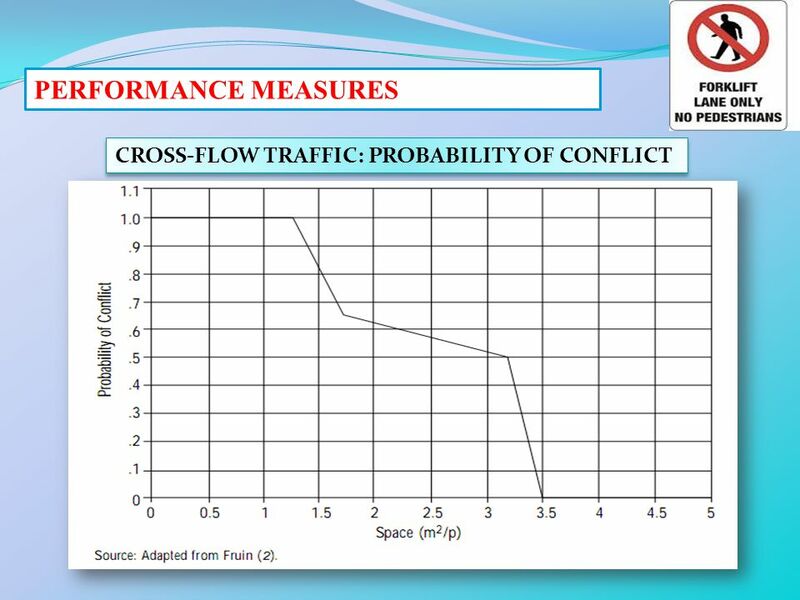 Coordinated Systems Two or more intersections Signals have a fixed time relationship to one another Progression can be achieved. INTRODUCTION TO TRANSPORT Lecture 4 Introduction to Transport Lecture 4: Signal Timing. CTC-340 Signals - Basics. 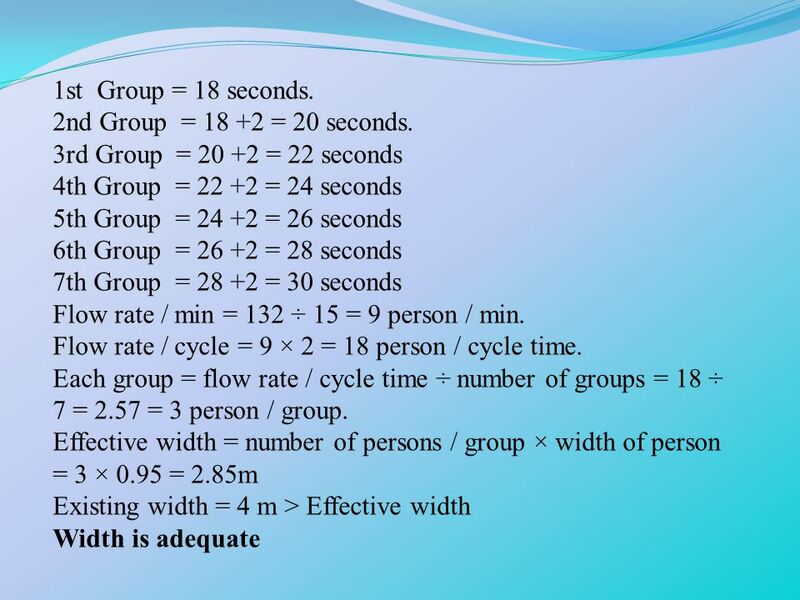 Terms & Definitions (review) Cycle - Cycle Length - Interval -. change interval - clearance interval- change + clearance = Yi. CE 4640: Transportation Design Prof. Tapan Datta, Ph.D., P.E. Fall 2002. 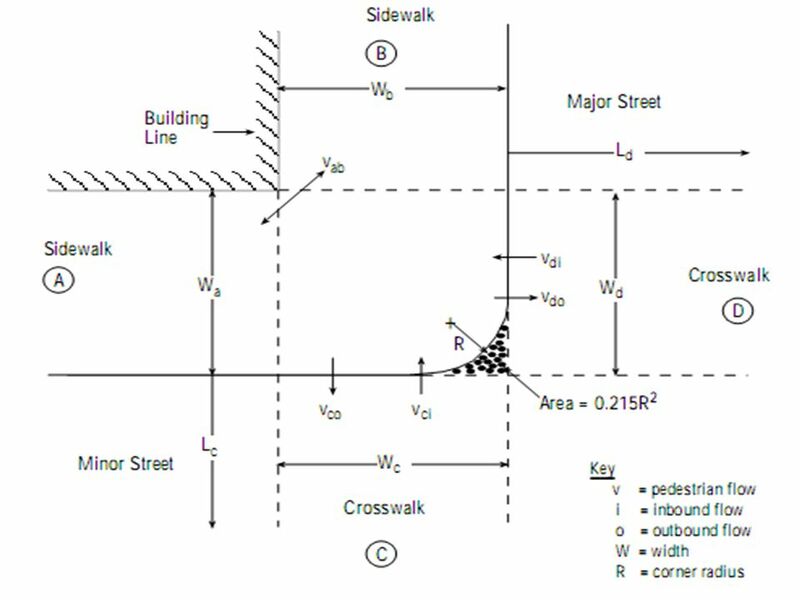 Federal Highway Administration University Course on Bicycle and Pedestrian Transportation Pedestrian Design at Intersections Lesson 11 Publication No.